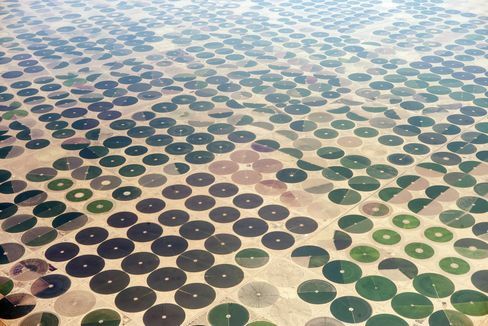 Cultured farms in sit in Saudi Arabia. For decades, only a few features punctuated the vastness of the Saudi desert: oil wells, oases — and wheat fields. The shift toward imports, which started eight years ago, is reverberating beyond the kingdom, providing business opportunities for grain traders such as Cargill Inc and Glencore Plc as well as for farmers in countries such as Germany and Canada. “The Saudis are the largest new wheat buyer to emerge,” said Swithun Still, director of grain trader Solaris Commodities SA in Morges, Switzerland. Ahmed bin Abdulaziz Al-Fares, managing director of the Grain Silos and Flour Mills Organization, the state agency in charge of cereal imports, told an industry conference in Riyadh last month that Saudi Arabia will import 3.5 million metric tons in 2016. That’s a 10-fold increase from about 300,000 tons in 2008, the first year local crops were curtailed. An agency presentation says the kingdom will rely on imports for “100 percent” of its wheat in 2016 for the first time. By 2025, demand is forecast to rise to 4.5 million tons as population growth drives demand for flour, positioning Saudi Arabia as one of the 10 biggest wheat buyers worldwide. Saudi Arabia is already the world’s largest importer of barley, used to feed camels; and among the top 15 in sorghum, another cereal used as animal feed; and of corn. 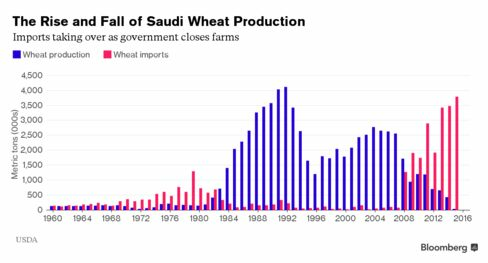 Saudi Arabia became a net exporter of wheat in 1984 from producing almost none in the 1970s. The self-sufficiency program became a victim of its own success, however, as it quickly depleted aquifers that haven’t been filled since the last Ice Age. In an unexpected U-turn, the government said in 2008 it was phasing out the policy, reducing purchases of domestic wheat each year by 12.5 percent and bridging the gap progressively with imports. The last official local harvest occurred in May, although the United Nations Food and Agriculture Organization projects that a small crop of about metric 30,000 tons for traditional specialty bakery products will “prevail” in 2016. At its peak in 1992, Saudi Arabia produced 4.1 million tons of wheat and was one of the world’s top 10 wheat exporters. In the Middle East, only Turkey, Egypt, Iran, Iraq and Syria grow significant quantities of wheat, although they often import to cover domestic shortfalls. Egypt, for instance, is the world’s largest importer because of its booming population’s demand for subsidized bread. Wheat traders said that rising purchases from Saudi Arabia were one of the few bullish factors in the grain market. The kingdom has become particularly important for Canada, Germany and the Baltic states of Lithuania and Latvia, from which it procures the bulk of its wheat. “Saudi is going to need more imports — but the world market can right now easily meet the increase in demand,” said Stefan Vogel, head of agricultural commodity research at Rabobank International in London. In turn, Saudi Arabia has been investing in foreign farmland — so far generating more headlines than crops — and grain-trading operations. In April, a Saudi-backed company agreed to buy a majority stake in the former Canadian Wheat Board in a C$250 million ($203 million) deal that gives it access to grain exports from Canada. Bunge Ltd., one of the world’s largest grain traders, and state-owned Saudi Agricultural & Livestock Investment Company (SALIC) partnered for the acquisition. SALIC was established in November 2011 to secure adequate food supplies for Saudi Arabia, according to its website. “Middle East food-deficit countries are moving into investing into agribusiness,” said Monika Tothova, an economist at the FAO in Rome. This entry was posted on Thursday, November 5th, 2015 at 9:32 am and is filed under Uncategorized. You can follow any responses to this entry through the RSS 2.0 feed. You can leave a response, or trackback from your own site.